Three-dimensionality can be seen as architecture's fundamental existence, the profession's acclaimed domain. 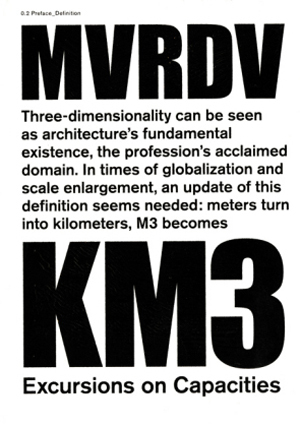 In times of globalism and scale enlargement, an update of this definition seems needed: metres turn into kilometres, M3 becomes KM3. 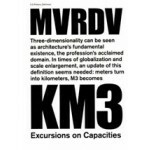 KM3 is a story about a world that is getting dense. Very dense. It constructs its logical response: a city that is denser. A city that is continuously under construction, with space for limitless capacities, populations. Beyond scarcity. Beyond separation. Beyond pessimism and protectionism. The 3D City. A free-fall in endless space. From right to left, from front to back, from above to below. Pure depth. KM3 is more a construct than an analysis. KM3 is a hypothesis, a theoretical city, a possible urban theory. KM3 can also be seen as a science-fiction novel, a twin pair that describes this upcoming city as an emerging presence, an already existing 'other' world. 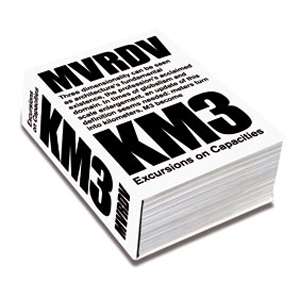 The book includes a DVD of animations and two urban planning software programs by MVRDV.